The Etruscan League - 530 B.C. Historians believe that the Etruscans were the first great civilization in the Western-European territory we know as Italy. 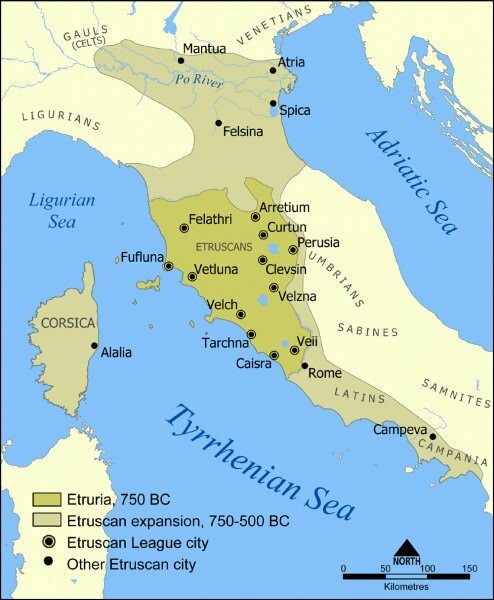 The Etruscans lived in the central part of Italy, and their civilization flourished between the 8th and 3rd centuries B.C. We don’t know much about the vanished civilization of the Etruscans. Part of the reason, for that lack of knowledge, may be due to their conquest by Rome (once just a small village on the Tiber River). Scholars do know, however, that the Etruscans used the Greek alphabet, to write their language, which they inscribed from right-to-left instead of left-to-right). When a greatly expanded Rome conquered the Etruscans, the people and their culture were assimilated into Rome (including the adoption of Roman ways), obliterated (including the eventual loss of their Etruscan language) or a combination of both. Religious rituals (including divination and soothsaying). Although we also don’t know much about the presumed (and still-debated) Etruscan League—an entity (or method) by which the people of different Etruscan city-states likely cooperated on trade, among other things—historians believe that the League’s cities and towns extended from the Po River (in the north) to the town of Campeva (in the south). Today we can’t even be sure whether Etruscans were native to the areas which they occupied or traveled to those places from somewhere else. Herodotus, historian of the ancient world, believed that they originated in the southern part of Lydia, located in contemporary Turkey). Future Etruscans, reported Herodotus, left this area due to a long-running famine. We think that our research provides convincing proof that Herodotus was right and that the Etruscans did indeed arrive from ancient Lydia. Since scholars have never been able to “crack” the Etruscan language, we still have much to learn about the people who were part of this important ancient civilization. Archaeologists get very excited anytime that new discoveries are (or may be) connected to the Etruscans. The map at the top of this page, called The Etruscan League - 530 B.C., depicts where Etruscans were living, on the Italian Pensinsula, during their civilization's ascendancy. Click on that image for a better view. Bos, Carole "The Etruscan League - 530 B.C." AwesomeStories.com. Oct 07, 2013. Apr 23, 2019.